Reports suggest that submarine cable SEMEWE4 cable – linking majority of internet and telephony traffic in Pakistan – has been cut near Alexandria, causing serious sluggishness for internet browsing in Pakistan. Various Internet Service Providers confirmed ProPakistani that cable cut has been reported and that internet speeds are impacted, throughout the country. Sources confirmed that SEAMEWE4 cable was cut at 12:04 PM (Pakistan time), causing degraded internet services. Many websites aren’t even accessible, or are opening very slow. ISPs say that no estimated time for the resolution has been communicated by the SEMEWE4. Reportedly SMW4 was cut last month too, but it got restored the same day. 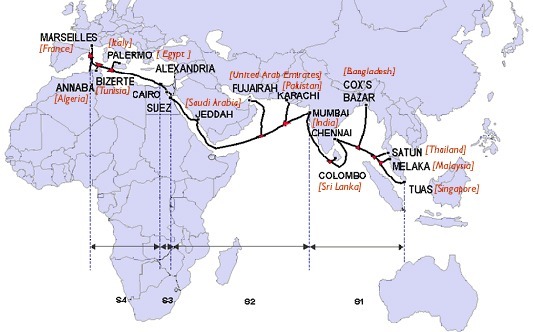 The SMW4 cable, also known as SEA-ME-WE 4 or South East Asia- Middle East-Western Europe 4 cable network, connects 12 countries: Pakistan, Indonesia, Singapore, Malaysia, Bangladesh, India, Sri Lanka, United Arab Emirates, Saudi Arabia, Egypt, Italy and France. That’s the same issue always happens to PIE network! Cant we have any reliable alternate? Users and web based services have survived. Yes i did face same issue. Is it fixed now? Cable was fixed at 17:09 PST. My internet speed is fine since this morning. Shouldn’t a cable cut affect everyone? @yasir please tell the source. you tube pause buffering not working please tell the solution if anyone knows. Useful information given in this article. It is now restored, I received an update email from my service provider that the cable has been restored and now fully operational. @Naveed, yes it is fixed now. Duniya ka wo kon sa wahid shakhs hai jo two Casts rakhta hai ?